Are you a passionate gamer who can’t imagine a single day without playing video games? Don’t worry, you are only one of millions of people around the world who simply need a comfortable chair to perform their tasks on a daily basis. Sitting in a chair for prolonged periods of time can lead to the development of numerous health issues, mostly affecting your lower and upper back. If you don’t plan on ruining your health completely, you should consider purchasing a good gaming chair. Why don’t you join us and take a look at the marvelous Steelcase Gesture office chair instead? The Steelcase Gesture chair is a design marvel, developed as a direct result of a global study which included 2,000 people in 11 countries all around the world. It is designed to be the best office chair in the world and it sure looks promising. Gamers, rejoice, this might be the ultimate gaming chair. When Steelcase designed the Gesture chair, they came to realize that there are countless different postures among people, so they went on a mission to make one perfect chair which would cater to the needs of all those people. It is a chair that is meant to make life easier while you sit around working for endless hours each day or simply playing video games. Included in the box is just the chair, and keep in mind that it is quite heavy when compared to some other contenders for the title of the best gaming or office chair in the world. The whole thing weighs 74 pounds! On the other hand, it is good to know that the chair comes preassembled and is ready to use right out of the box. Getting right down to the point, the Steelcase Gesture is all about adjustability. Probably the most unique feature is the so-called 360 Arm. These are actually armrests which are designed so that they move just like human arms. This is meant to support you in virtually any position while sitting in the chair, no matter which type of device you operate at the moment. The armrests can be pulled up and down, and they also move forwards and backwards, while you can swivel them to the left or the right. There is a torsional spring in the core equalizer that takes care of all the adjustments for your body posture. You can adjust whether you want more or less lumbar support, while the backrest can also be tilted forwards and backwards. The so-called 3D Liveback is designed so that it mimics the way your spine moves by changing its shape accordingly. The seat can also be adjusted, as you can fiddle with its depth and height, almost like in the better-equipped luxury cars. It is filled with foam, accompanied by strategically positioned air pockets, so the seating experience is almost like sitting on a cloud. Even though all these adjustments really make it possible for the chair to adapt to most people and their postures, we didn’t really like the fact that it doesn’t come with a headrest. As a direct result of that, taller people might not find it all that comfortable. The visual appearance of the chair is sort of a mixed bag. The back side looks like it just got out of the latest sci-fi movie, so some people might consider it as a true gamers’ chair and a little too childish. On the other hand, the chair comes in many different finishes, so no matter the color of your room, you’re sure to find one that fits just about right. Since the chair comes with so many adjustment features, we strongly suggest you take some time and fiddle with all of them. Once you’ve tried out all the different combinations, you’ll be sure that the chair now suits your body and that you are indeed getting the most out of it. It is completely understandable that not everyone is able to invest such big amounts of cash in a gaming chair. 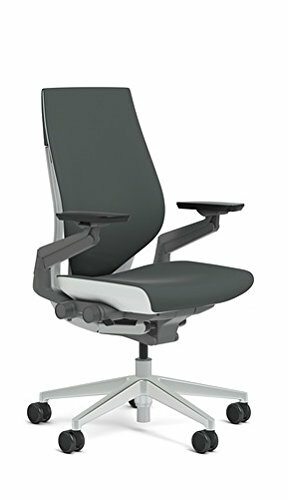 If you can’t afford the Gesture chair or you simply don’t want to spend that much money on a chair, why don’t you take a look at some other models from Steelcase? The Steelcase Think won’t break the bank but it will still provide you with quite a comfortable sitting experience. On the other hand, if you want to compare it to another flagship office chair, we strongly recommend checking out the Embody chair by Herman Miller. It is the Rolls-Royce of office and gaming chairs. It is rather hard to tell whether the Steelcase Gesture really is THE best gaming chair in the world, but it surely is one of the best out there. Yes, it comes at quite a hefty price, but we strongly believe that it’s worth every penny. The back side might look a little too sci-fi and the knobs for adjustments might come off as a little too plasticky, but you will surely struggle hard to find a gaming chair this comfortable, no matter the size of your budget.